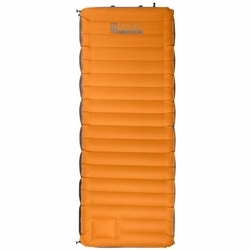 NEMO Nomad 30XL Sleeping Pad. Nomad™ the intelligent alternative to the inflatable mattress. Inflates quickly to 6 inches with built in footpump. Link two together to make a queen-sized bed, allowing you to create a luxurious camping experience. Compared to other high volume camping mats that require a 12V or battery powered pump, Nomad™ has a built-in, high speed, large capacity foot pump. Two link together to make a full queen-sized bed, for a luxurious camping experience. Dual dump valves mean quick deflation, the micro adjust valve ensures your desired firmness. A superior alternative to the large inflatable mattresses popular with campers. The 6" height is enough to attract folks who aren't excited about "sleeping on the ground."